As the 1st January comes round each year, most people think about tightening their belts a little, and look for easy ways to do so. I have done exactly that over the past month and thought i’d share the pretty simple ways how I have saved £1000 in the space of 4 weeks! I joined Quidco a few years ago now, and have saved over £1000 so far with them. If you are not a member of a cashback site then what are you waiting for?! You basically get cashback for your normal shopping!! This is particularly good around christmas time if you shop online, and again during the sale period when you are picking up all of those bargains. I earned £200 cashback over the December period!! This one is an absolute no brainer. Every year or so I log on to comparison websites to see who has the best deals out there and switch. It literally takes no time at all, and means that you are always getting the best value deal. What often happens, is at the end of the ‘special rate’ if you don’t switch over, then they move you over to their standard tariff which is often well over the odds. Additionally, switch to a provider via a cashback site, and you often get cashback too. I saved £300 on switching to a new joint tariff, as well as £80 cashback! Working in central london, it’s so easy to just pick up lunch, and the last thing you want to do after a busy day is prepare something to take the next day. That is until I sat down and thought about just how much money I was throwing away on lunches! The average lunch I was buying was around £6 / working day. Over a working month that’s £140!!!!!!!! And the thing is, I was also getting fed up of having to chose what to have when time was short. So, I now take lunch for at least 4 days of the week, and my bank balance has definitely seen the benefit! Having watched Marie Kondo over the holidays, I thought about just how much rubbish we had (but rubbish that had hardly been used and in good condition) – so, instead of throwing it away, I started putting things on ebay and earning a bit of extra pocket money this way! As well as the lunches, we would eat out / get takeaway twice a week. At £30 minimum each time, we have now reduced that to once per week for the time being, which will save us over £100 per month. Instead, on those days, we cook ourselves a new dish – which is less than a quarter of the price most of the time! Whenever the renewal premiums come through for insurance, be it car / house / health, the easiest thing to do is to let it just carry on and pay the higher premiums. DO NOT DO IT!! In the last month I have saved £150 on my car insurance, and £50 on my home insurance, all by calling them up and haggling. The best thing to do is check what premiums other companies are offering, and call the company up to see if they will price match – the majority of the time they do! If like me you love reading, but a) don’t have the space to store books, and b) it costs you a fortune – stop buying books! I have recently re-discovered the library again, and it’s 70p in my local library to reserve a book versus between £5 – £10 to buy it! I’ve been pleasantly surprised at all of the modern titles available and am on my 4th book in the space of four weeks! Breakdown cover is another area where it’s really easy to just auto renew, because if you drive, you’ll always need it right? STOP! The two main breakdown cover companies love fighting for customers, so if you haggle enough, they bring the prices right down! In the past 3 years I have always asked them to price match and they have – this year my renewal quote was £200 and they slashed it to £90. If you are going over to another provider, make sure you do it via a cashback site as there are always good deals for new policies. There are so many bank accounts out there at the moment who are offering between £100 and £200 for you to switch. The process is easy, and they do everything for you (including changing all of your direct debits over) – couldn’t be simpler! My go to website for money saving tips (especially bank accounts, insurance deals etc) has to be Money Saving Expert – it’s fab! 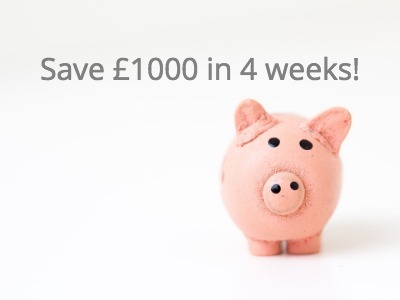 So there you have it, a pretty simple way to save £1000 or more in the space of a month. I’d love to hear how you save money? ← Why only set goals at New Year? they are soooo worth it! Cutting down on takeaways is a good idea. Thanks for linking to #kcacols and hope to see you again soon. I have been reserving books at the library for a while now. It costs £1 at our local one, but it is still a lot less than buying them. i can’t believe i hadn’t started doing it earlier!